Landaas & Company newsletter, October edition now available. U.S. manufacturers reported a 13th consecutive month of expansion in September, at the fastest pace since 2004. Purchasing managers surveyed for the ISM Manufacturing Index reported that hurricanes along the Gulf Coast created hiccups in supply chains and pricing, but the effects helped boost the index. New orders were at a four-year high, and production and employment components were strong, as were export orders, which could be benefiting from renewed vigor in economies abroad. An industry much less dependent on global conditions showed continuing promise in August. Construction spending hit an annual rate of $1.22 trillion, the 11th consecutive month above the 2006 peak. The Commerce Department said the pace was up 0.5% from July and 11.6% ahead of the August 2016 pace. A rise in single-family housing helped lead the gain, and construction spending should be expected to rise more with rebuilding after hurricanes Harvey, Irma and Maria. The annual sales pace of motor vehicle sales hit a 12-year high in September as consumers started replacing vehicles lost to the hurricanes and others completed transactions that had been stalled by the natural disasters. The rate of vehicle sales – a key component of consumer spending – grew to 18.6 million vehicles in September. Manufacturer reports gathered by Autodata Corp. showed the sales rates rising 15% from August, with domestic leading all categories. Service businesses expanded in September at the fastest pace in five years and for the 93rd month in a row, according to the Institute for Supply Management Non-Manufacturing Index. The largest sector of the U.S. economy is suggesting that the nation’s gross domestic product is expanding at a 4.2% annual rate, the purchasing managers group said. Businesses reported disruptions from recent hurricanes but otherwise indicated confidence in current conditions. The U.S. trade deficit shrank 2.7% in August to its narrowest margin in 11 months. The $42.4 billion gap resulted from a 0.4% rise in exports and a 0.1% decline in imports, according to the Bureau of Economic Analysis. The pickup in exports is a possible sign that U.S. companies are benefiting from a relative weakening of the dollar, which makes American products more affordable overseas. 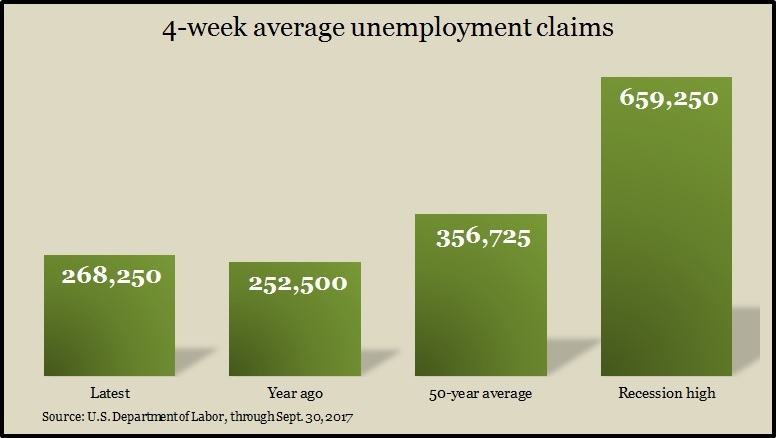 The moving four-week average for initial unemployment claims fell for the first time in five weeks, following the hurricanes in Texas, Florida and Puerto Rico. Over those five weeks, the moving average grew 16.3%, eclipsing year-ago levels. Even so, the measure remains below the 50-year average, according to Labor Department data, suggesting that the employers are reluctant to lose workers and the labor market is tight. In a sign that manufacturing continues to advance, the Commerce Department reported that factory orders rose 1.2% in August, the second gain in three months, staying 5.6% above year-ago levels. Excluding the volatile transportation equipment category, orders increased for the third month in a row, rising 5.6% from the same time last year. Orders for non-military capital goods excluding aircraft reached their highest point since October 2015, suggesting a comeback in business investments, which were up 3.4% year-to-year. Employers had a net loss of 33,000 jobs in September, the first decline in seven years, according to a preliminary report from the Bureau of Labor Statistics. Gulf Coast hurricanes played a big role in the report, and analysts expect short-term effects and subsequent data revisions. Revised estimates showed employers adding 38,000 fewer jobs in July and August than previously reported. The bureau’s separate survey of households found nearly 1.5 million workers unable to report to their jobs last month because of weather last month – the most since a deadly blizzard hit the Northeast in January 1996. The unemployment rate – a less reliable indicator of labor conditions – fell to 4.2%, the lowest since January 2001. The Commerce Department said wholesale inventories rose less than sales in August, which lowered the inventories-to-sales ratio for the first time since January. Inventories grew 0.9% vs. a 1.7% increase in sales. The lower ratio suggests wholesalers are managing to align their stockpiles closer to customer demand. Since early 2015, the ratio has been around levels experienced during the recession.